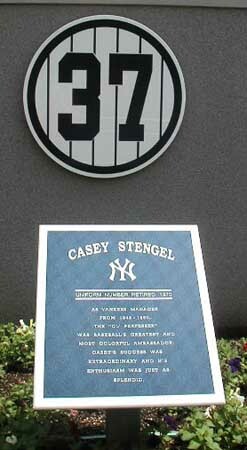 The only person to have worn all four New York City baseball uniforms (New York Giants, Brooklyn Dodgers, New York Yankees, New York Mets), Stengel's number 37 was aptly retired by both the Yankees and the Mets. He is most famous for managing the Yankees from 1949 to 1960, when he was involuntarily retired for being "too old" after losing a heartbreaking World Series to the Pirates. In classic Stengelese, he remarked, "I'll never make the mistake of being seventy again!"